Tidbits: So this is a recipe I got from a friend’s dad. 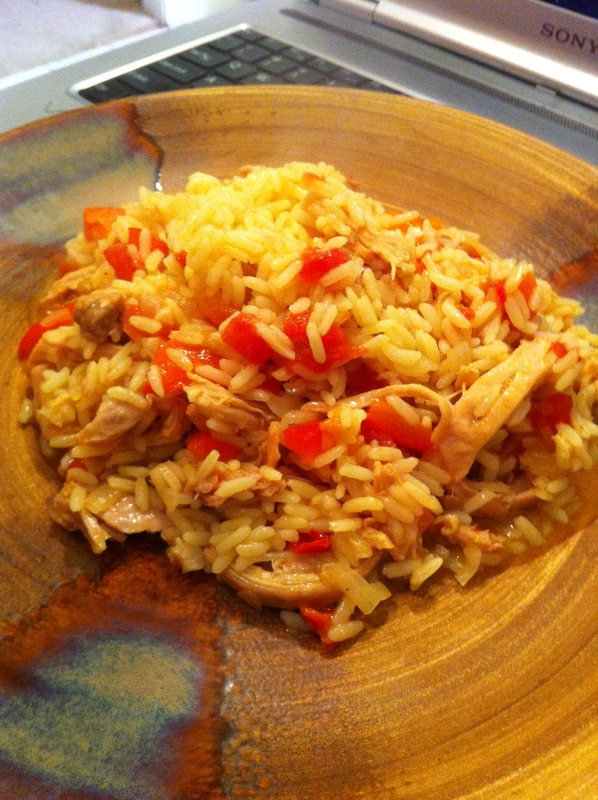 It’s quick and delicious – and when I have chicken sitting in my freezer, it’s my go to recipe. You can leave the chicken whole, or you can shred it. I prefer to shred it – but it does take longer. Enjoy! 3. Cook onion, bell pepper, and garlic until onion is transparent in chicken oil, about 6 min. Add tomatoes, pimientos, cumin and bay leaf and cook, stirring, 5 min. Add chicken and wine and cook 5 min. 4. Add the stock and bring to a boil. Add the drained rice, stir, cover, lower heat a bit and cook until rice is tender, about 17-20 mins.